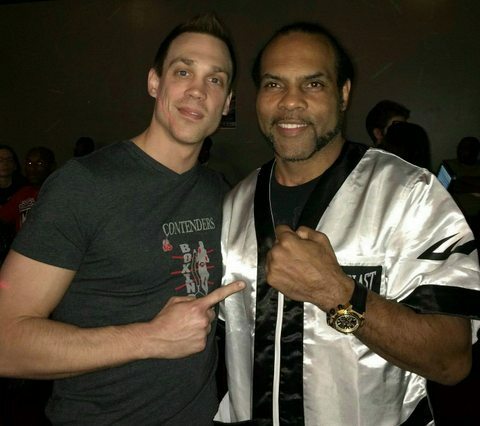 A night of exciting fights in Charlotte, NC, a city not traditionally known for its boxing venues but that is looking to change thanks to Jonathan Nazeer of JKN Sports, Entertainment & Marketing. I was fortunate to be ringside at the Midnight Rodeo Thursday Night Fights for what turned out to be an excellent card stacked with young talented boxers. The card started off with 5 amateur bouts, each improving in skill and action. However, the three professional fights are what stole the show that night. Famed former boxer and current trainer John David Jackson was in the corner for one of his promising young prospects Steve Geffrard. The cruiserweight squared off against Shannon Miller who was simply no match for Geffrard’s superior boxing skills. Geffrard used an excellent high guard peek-a-boo style walking down his opponent landing shots seemingly at will while blocking almost everything thrown by the over matched Miller. Miller was dropped in the first round after a perfect left hook landed to the top of his head. He beat the count but it was obvious his legs were not under him stumbling around the ring like a drunk as Geffrard kept attacking. It was impressive to see Geffrard not get overzealous and punch himself out looking for the early KO. Instead he took his time, setting up his punches with a sharp straight left jab while maintaining distance and keeping a high guard for any possible counter punches. The next 3 rounds were more of the same leading to Miller quitting on the stool after the 4th round. Out of the talented fighters showcased tonight, Geffrard appeared to be of the top pedigree. He uses his height and reach well and certainly packs power in his fists when he lets them fly. Timing is everything in boxing, something that Geffrard uses well. Teamed up with John David Jackson I expect good things to come from Steve, so lookout cruiserweights. The crowd seemed to come electric when Carrie Flock of Charlotte made her way to the ring; she was definitely the fan favorite. Even though she hasn’t fought professionally since mid-2005 she still had a good amount of supporters in the crowd, but I’m sure by the time the fight was over she gained many more. Her challenger Natalie King was tough as nails and fought with extreme intensity from start to finish, although she lacked skill. Flock clearly the more technical boxer used distance and combination punching to neutralize King’s constant straight forward onslaught. Whenever it appeared Flock was becoming overwhelmed by King’s crude brawling style she would slip out, step back and land powerful 1-2’s to slow down and back off King. By the end of the first round almost everyone was on their feet and screaming with excitement. King showed tremendous heart and chin somehow absorbing all the perfectly placed punches in bunches by Flock to make it to the final bell, she never stopped trying to win. Flock proved to be far more skilled cruising to a unanimous decision albeit a bumpy ride to the end. One could say Flock gives the phrase, “you punch like a girl” a whole new meaning. Jamal Brady of Charlotte made his pro debut against game challenger Demetric Cox of Raleigh. As this middleweight bout started you could tell that Brady was the more comfortable and relaxed fighter in the ring. Cox seemed to be plagued by nervous energy moving too much, with too many head faints and not planting his feet to punch. Conversely Brady took his time during the first round choosing his punches wisely and making them count, landing two flush right hands which stunned Cox causing him to clinch. Unfortunately, they clashed heads resulting in bad cuts over each’s left eye. After the ring doctor inspected each fighters bloody eye he felt it necessary to call the bout to a halt declaring Brady the winner by TKO. Truly a shame as the fight was just beginning to heat up. Brady was visibly upset over the stoppage, he wanted to get the win the honest way, which I have no doubt he would have had the fight continued. Brady showed excellent skill and patience in the ring, if he sticks with it he’ll be sure to become a favored prospect in the future. All in all it was a fun filled and energetic night at the fights. Everything from the refs, judges, to the announcer and DJ, to the crowd bar – everything about this event was high quality, entertaining and certainly worth the time and money. As a lover of the sweet science I can only hope that this is a continuing trend for the Charlotte area.